In this article we’ll cover the basics of how to play, all the important rules, the most common game variations and some special tips and tricks you can use to get the most out of your money. There are lots of different video poker games but they all work the same basic way. First you have to choose how much to bet. Video poker usually uses “credits” or “coins” that are assigned a money value, for example $1. After you’ve chosen how much a credit is worth, you have to select how many credits you want to bet on each hand. Sometimes there’s a special button to bet max credits which is usually five. After you bet you’ll receive five cards face-up. The goal of video poker is to make the best five-card poker hand and you do it by holding some of your cards and exchanging the others for new cards. You can choose to hold all, some or none of your cards. After you draw new cards, or stand pat (which means keeping all five of your original cards) your hand will be compared to the payout table to see how much you win. The most basic kind of video poker is called Jacks or Better but there are lots of variations that introduce fun new rules and twists to the game. Here are the most popular kinds of video poker you’ll see in live and online casinos. Jacks or Better – The most common form of video poker. The object is to make a pair of jacks or better to get paid. The payouts can differ from machine to machine but the good ones offer a very low 0.5% house edge if you use proper strategy. Look for “9/6 Jacks or Better” because it has the lowest house edge. 9/6 refers to the payouts for a full house and a flush which are 9 to 1 and 6 to 1, respectively. Double Bonus – This is very similar to Jacks or Better except there’s a special bonus payout for making four of a kind. The best version of this game to look for is known as 10/7 which again refers to the payouts for a full house and a flush. 10/7 Double Bonus actually has zero house edge when played perfectly but it’s much more common to see the 10/6 version of the game that has a roughly 0.9% house edge. Double Double Bonus – Again, very similar to Jacks or Better except with even more special bonuses for big hands. This game generally has a slightly bigger house edge than Double Bonus but it’s still relatively low at about 1.1%. Deuces Wild – Twos are wild and the minimum winning hand is three of a kind since wild cards make big hands much more common. The house edge on most Deuces Wild machines is around 0.3% when you play perfect strategy which puts it among the best odds of any bet in a casino. Joker Wild – Unlike the variations described above, this game is played with a 53-card deck (52 regular cards plus a joker). Usually the payouts start at a pair of kings or better and if you can find the full pay version, it’s actually got a small player edge built in. You can tell if it’s a full pay machine by looking at the payout for four of a kind. Full pay machines pay 20 to 1 on quads. 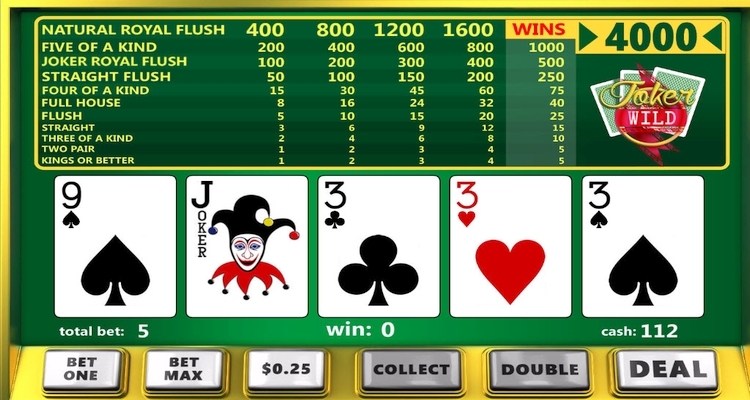 The more common version of Joker Wild pays out 18 to 1 for four of a kind which creates a house edge of roughly 1%. Aces and Eights – Very similar to Jacks or Better but with special bonus payouts for four of a kind aces and eights, as well as a slightly smaller bonus payout for four of a kind sevens. The precise best strategy for video poker depends on which game you’re playing but there are some general concepts you should be familiar with that can always guide your decisions. First: What is your goal? If you’re playing optimal strategy the decisions are made on what gives you the highest expected value in the long term. But if making your money last and enjoying a fun time are priorities for you, make sure to factor that into your decisions as well. For example, consider you draw a full house with four to a royal flush. The optimal decision is to hold the four to a royal flush but you’re not going to hit it very often. If your priority is to have fun and make your money last as long as possible, you may opt to hold the full house because it guarantees you a good win. Below is a simple strategy for the most common kind of video poker: Jacks or Better. 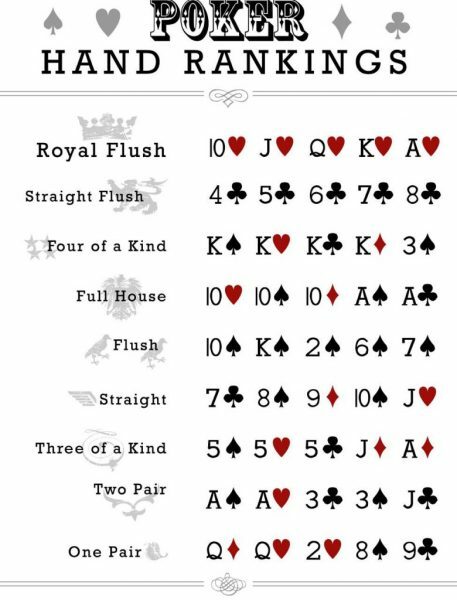 To use the chart, figure out all the possible ways to play your hand and then pick the one that ranks highest on this list. As we covered earlier, video poker machines have some of the lowest house edges in the casino but what if there was a way to actually swing the odds in your favour? That’s where casino loyalty programs come in. All casinos, online or live, offer some form of rewards program and if you want to get the most out of your money and your gambling experience, make sure to sign up for it and use it every time you play. In brick and mortar casinos it’s up to you to sign up, get a player card and put the card in the gaming machine before you start playing. Luckily in most online casinos all that’s done automatically but you should still do the research to make sure you’re getting in on every possible bonus.